I was doing fine, really. That is – I was doing fine, despite an emotional and exhausting work week, one which resulted in our team closing a major acquisition in the DFW area – years in the making, with many, many helping hands. I was just exhausted, and I knew that would not bode well for me in getting through the weekend. This weekend, after all, was a once in a lifetime. We would be taking our 18 year old daughter to college at Southwestern University in Georgetown, TX. I know many of my friends were in the same situation – and at least our daughter is only a short 3 hour drive away. In Texas, that’s nothing. And I was handling it all very well, I thought. That is, until we got to her dorm room on Friday night. I was not going to force myself on her; I was not going to insist on helping her unpack everything. I did, however, insist on one thing: helping her make her bed. I may not have much to say about the next 4 years of her life, but I could at least start her out with a pleasant feeling of a warm bed and new sheets. Somehow, she agreed to that. We opened the new pillow covers and pushed the pillows in, fluffing them gently. We pulled out the new duvet cover, and stuffed it with the feather cushion. I messed up a bit – didn’t get the corners right – but Shannon helped to fix that. Then I found the sheets – the ones she had picked out specifically. As I shook them out and placed them on the bed – first the fitted, and then the flat sheet – I pulled the bright duvet over, then pulled back a corner to let the polka dots peek through. And as I ran my hand over the dots, the memories flooded back. 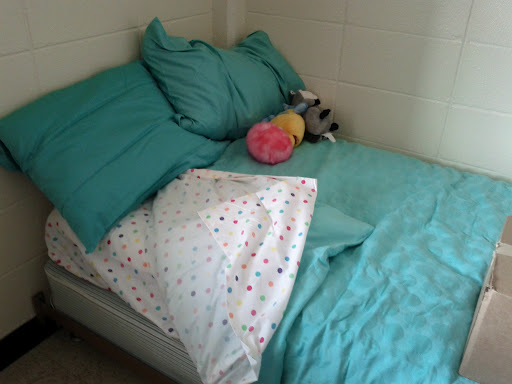 See, Shannon’s crib bedding consisted of brightly colored primary sheets – also a polka dot theme. Looking at the sheets, I realized what a full circle we had closed: from the celebration of bringing her home to her own crib (Shannon was born 8 weeks early and weighed 3 1/2 lbs. She was in the hospital for about a month); to the celebration of leaving her to her own bed, in this new phase of her life. I should be celebrating. To sail on the wings of a song your heart sings; these things I wish for you. To smile at the stars as they shine in the night. I wish for you fortune in all that you do. These things I wish for you; these things I wish for you. So – I was doing fine, really. The memories were there, just as they should be. And I knew she’d be staying in this new place, starting on the life of happiness I have prayed for her every step of the journey. My job here is done. She is ready. And I’ll be fine, too. Really. 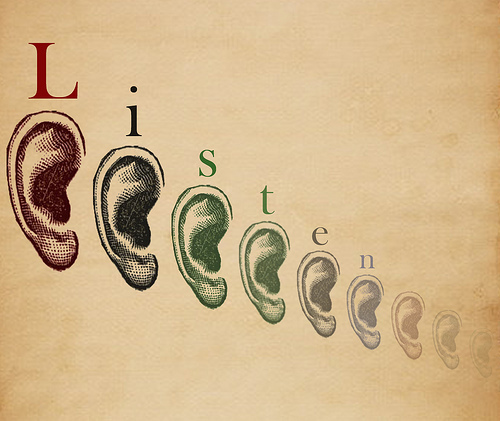 We cannot begin to understand each other if we don’t listen. Don’t spend more time crafting the answer than understanding the problem. Listening and love are inseparable.